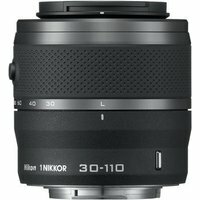 The Nikon 30-110mm f3.8-5.6 VR 1 Nikkor Lens is a versatile, compact lens perfect for the Nikon 1 series and features a 3.7x zoom range (35mm equivalent: 81-297mm). Equipped with Vibration Reduction as well as smooth, quiet autofocus operation, the Nikon 30-110mm lens is ideal for still and HD movie shooting. The smooth aperture mechanism lets you move easily from sharp to soft backgrounds to allow the subject to stand out, even when shooting a movie. The Nikon 30-110mm lens is perfect for shooting candid portraits and distant subjects with ease.